Zucchini (Courgette), Feta, Peppers, Black Olives, Thyme for Cooking side dish. Use a smaller zucchini (courgette) for this dish, and a yellow or red pepper. Add the feta and olives at the end so they only start to get warm. Cut zucchini into sticks about 1 1/2" (4cm) long. Add pepper, zucchini and sauté until zucchini is tender, 7 - 10 minutes. Add oregano, Worcestershire and stir to combine. 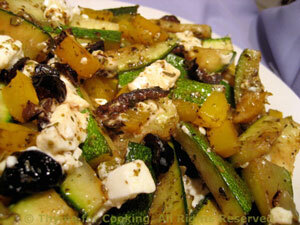 Stir olives and feta into zucchini, remove from heat and serve.